The experience of merely surveying the National Film Registry (est. 1988) and the 550 films that it is composed of is a humbling one. Over the 105 years that the films present span, the jewel in America’s crown that is film has provided the world with an array of the most profoundly inspiring and purely entertaining visual experiences in history. From the timeless CITIZEN KANE to the time-traveling THE TERMINATOR, and the far reaches of A NEW HOPE to bedroom of TOY STORY, the registry is a tribute to the greatest achievements in film, and it is in THESE AMAZING SHADOWS that the importance of the registry and the films it contains is truly revealed. Directed by PAUL MARIANO and KURT NORTON, THESE AMAZING SHADOWS is a documentary journey through the registry, a journey that unveils it as a blueprint for the American existence, an existence of hopes, dreams and most importantly, the unexpected. 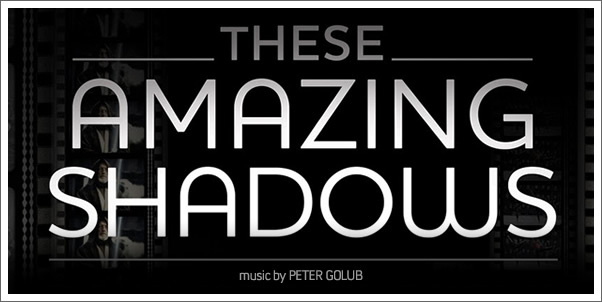 In documenting this list and the various films, it perhaps composer PETER GOLUB that will find himself under the greatest scrutiny from those who venture deep into the aesthetic texture of the documentary. As the featured films flash upon screen, with each comes a certain expectation and memory that viewers will be expecting to be upheld. Firstly is the infallible visual aspect; the iconic images that whisk audiences away remain unchanged. Secondly, and crucially, is the music. The unforgettable soundscapes of BACK TO THE FUTURE and 2001: A Space Odyssey carry the weight of decades of acclaim and audience recognition, and it is when films of such musical calibre make their appearance that a conflict arises. In making THESE AMAZING SHADOWS one can imagine that at a certain point in production the decision to either utilize the original scores of the various films or opt for an entirely original score was made. In this case an original score was chosen, perhaps due to the various issues that licensing presents or perhaps through the desire of the filmmakers to carve their own mark in film history, rather than remaining reliant on those that came before them. GOLUB’S competent efforts in THESE AMAZING SHADOWS largely reinforce the latter as a wise choice, yet it is still often quite difficult to detach the films onscreen from their original musical accompaniment and it is because of this that GOLUB’S achievements may never be fully appreciated.